Make sure your profile is 100% complete. You can populate your profile by pulling information from a past event or syncing to your LinkedIn page. Personalize every meeting request – write descriptive subject lines and don’t be vague in the body of your request. Let attendees you’re requesting meetings with know what you have to offer. Search for attendees you’ll want to meet with using the system’s intuitive filtering tools. Search by job title, function, sector and more. Keep your leads all in one place by adding potential partners to your favorites. Stay organized on site by adding the sessions you want to attend to your personal agenda, a feature that keeps all of your confirmed meetings and sessions in one place. Respond to all meeting requests, including declining users that you do not wish to meet with. Turn connections into true partnerships by following up long after the conference has ended using the Message tool. 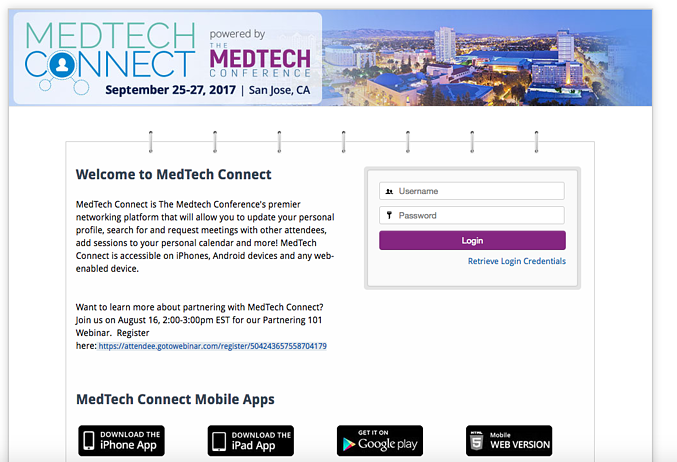 MedTech Connect Demo – Dave Bialkowski, Executive Vice President, JUJAMA, Inc.